Property occupants have an obligation to keep visitors safe. Premises liability holds property owners legally responsible for injury when an unsafe condition caused injury to someone. The idea behind premises liability is that people should have a reasonable expectation of n,ot getting hurt on someone else’s property. In Ontario, owners who act irresponsibly with regards to the safety of others can be held accountable. The most common accidents arising from an unsafe property are ‘slips and falls’ or ‘trips and falls’, although car accidents and recreational accidents can also arise from unsafe conditions. In any circumstance that results in serious injury from an unsafe property, an accident victim may make a claim for damages against the negligent party. The experienced premises liability lawyers with the ILO group can advise you on the strength of your claim and the legal options available to you. Under the Occupiers’ Liability Act, the occupier of a property in Ontario is required to keep people reasonably safe from harm when they enter the property. Conversely, property occupiers can be liable for injuries that occur on their property if they did not take reasonable steps to keep visitors safe. What are the legal obligations of property owners/occupiers under the Act? An occupier is an owner, tenant or another party who is in physical possession of a premises, or has responsibility for and control over a premises and the activities that are allowed on the premises. The following are examples of premises where the owner/occupier has responsibility for a user’s safety. Landlords who are responsible for the maintenance of a particular property have an obligation to take reasonable steps to keep both their tenants and anyone coming onto their property safe. However, tenants are responsible for injuries arising from hazards over which they have control or responsibility. If there is a potentially unsafe condition on a premises, occupiers are required to clearly and adequately warn anyone entering the property of the danger. There are a few exceptions under which an occupier may not be liable for injuries to users of a property. If someone willingly assumed the risks on the property, the property occupier will not be liable as long as they did not act with reckless disregard for safety or intentionally put someone in harm’s way. In this context, a person who signed a liability waiver may not be able to hold the property owner responsible for their injuries. However, a liability waiver does not always absolve property occupiers from responsibility, for example, if the injuries arose from an unexpected hazard that a reasonable property owner should have fixed. Someone with the intention of committing criminal activity cannot hold a property owner liable as they are assumed to have willingly assumed risks on the property (subject to 1). Trespassers are assumed to have willingly accepted risks on a property (subject to 1). On a recreational premises where no fee is charged, people coming onto a property willingly assume the risks on the property (subject to 1). Recreational property may include farms, forests, private roads, recreational trails, wilderness areas and golf courses that are closed for the season. Injury caused by the negligence of an independent contractor if the occupier had reasonable expectations that the work would be properly completed and that the contractor was competent. In the trial, Burrough v. Town of Kapuskasing, 1987, a tennis player sued the Town of Kapuskasing for injuries that occurred during a tennis match held at a community tennis club. Mr. Burrough suffered a torn ligament and serious injuries to his right knee when he fell after his foot became lodged in a crack on the tennis court. The 33 year old man required surgery after his accident and was incapacitated for at least eight months. Mr. Burrough was an avid and skilled player who regularly played at the courts where the accident occurred and where the crack in pavement had existed for some time. He admitted that when he plays, his complete attention is directed at the competition and he ignores potential dangers that may exist. The judge ruled, in this case, that Mr. Burrough willingly and voluntarily assumed the risks of the competitive tennis game on the premises at the time, and therefore the Town of Kapuskasing was not liable for his injuries. Property owners or occupiers are generally not liable for injuries that solely resulted from the recklessness or carelessness of the injured person. When someone falls while wearing inappropriate footwear in slippery or ice conditions, then they may be held responsible or at least, contributorily negligent for their own injury. The pain and suffering and mobility problems that result from permanent injury are a good reason for every individual to anticipate dangerous situations and take responsible steps to avoid them. However, circumstances that could potentially result in accidental injury to children demand a higher standard of safety from property occupiers, as children cannot be expected to anticipate the same dangers as adults. Some of the most tragic accidents and serious injuries result when a person’s judgement is impaired by alcohol or drugs. There are numerous instances where individuals suffered severe injury when they dived into shallow water, fell from a height or lost control of a vehicle while under the influence of alcohol. When a victim was under the influence of alcohol and the accident could not have been reasonably foreseen by a property owner, the accident victim may be judged responsible for their own injury. In Buehl Estate v. Polar Star Enterprises Inc. (H.C.J. ), 1989, damages were sought by the estate of a man who fell out of a patio door from the second floor of a newly constructed lodge while he was very intoxicated. There was no balcony at the door, a circumstance of which the man had been clearly warned by the owner of the lodge. In this case, the judge ruled that the deceased was 65 per cent contributorily negligent for his fatal injury; however, the owner was found partially negligent for not having foreseen that the guests might open the door for ventilation and also that they may consume alcohol and fall. It was stated that the patio door should have been nailed shut to ensure safety. Under what circumstances may an owner or occupier be liable? The Occupiers’ Property Act governs premises liability for a broad range of establishments and owners. Business owners are held to the highest standard of care to keep the people and/or public that enter their properties safe. If someone is injured on a commercial property such as a store or restaurant, owners who do not have a reasonable procedure in place for inspecting and fixing unsafe conditions may be found liable for any accidents and injuries that occur. These are common unsafe situations where occupiers may be held liable if someone comes to harm on their premises. Failing to clean up a spill in reasonable time. Failing to salt, sand or remove ice (that the owner should have been aware of) on their driveway or walkway. Failing to clean up debris or put away objects that present a foreseeable danger. Uneven walking services that a reasonable person would not have anticipated. Infrastructure, such as stairways or walkways, that is in a poor state of repair and/or inadequately maintained. Hazards for which there were no warnings or clear signage. Failure to inspect premises for hazards. Providing alcohol to individuals, resulting in injury that should have been foreseeable. Drowning hazards of which a user was not warned. Homeowners can be held liable when injuries to visitors to their property, particularly to children, result from an unsafe condition that should reasonably have been foreseen. Civil suits against homeowners most often involve drowning accidents, slips and falls on unsafe surfaces, and accidents resulting from excessive drinking. In the trial, Sauve v. Provost (Ont. H.C.J. ), 1990, Mrs. Sauve sued her parents for injuries she received when she leaned against a rotten porch railing which broke and caused her to fall approximately four feet to the ground. Mrs. Sauve, who was eight months pregnant at the time, tried to protect her unborn baby from harm by putting out her arms, which resulted in serious fractures to both wrists. Mrs. Sauve was hospitalized for two weeks; she required surgery; and was in considerable pain for some time after the accident. Her injuries are permanent and will be a source of pain for the rest of her life. She was also unable to care for herself or her three young children (including her newborn) during the recovery period, and unable to return to her job. The Provosts had learned that the floor of the porch was rotten and needed replacement eight years prior to the accident. The trial judge ruled that Mr. Provost should have periodically inspected the porch to determine the condition of the railing. If inspections had been made, the defect would have been discovered. The judge stated that an “occupier cannot escape liability by failing to inspect his premises and thereafter rely on his lack of knowledge”. Consequently, the court found that the Provosts failed in their duty of care to keep visitors to the property safe and were thus liable for Mrs. Sauve’s injuries. Mrs. Sauve was awarded special damages of almost $44,000 for lost income and out-of-pocket expenses (including child care) and general damages of $50,000 (for pain and suffering). Municipalities are responsible for maintaining safe conditions for anyone who uses or visits government premises, including roads. Municipal liability is also governed by the Ontario Municipal Act (2001), which defines municipal responsibility, jurisdiction and standards for maintaining a broad spectrum of infrastructure and services. Municipal liability differs from property liability for businesses in some contexts. For example, with respect to municipal liability in the maintenance of sidewalks, municipalities must be found to be ‘grossly negligent’ in order to be deemed liable for someone’s injuries. Accidents and injuries on municipal or government premises often occur when ice and snow on municipal property result in slip and fall accidents or collisions that may be attributable to a municipality’s failure to fix the dangerous condition in a timely manner. When someone is seriously injured in an accident that was likely caused by the carelessness or negligence of another party, they are entitled to file a negligence suit for damages. 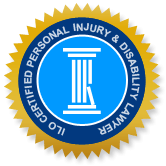 The injured person may be entitled to damages for past and future income losses, housekeeping and home maintenance expenses, medical and rehabilitation expenses, and non-pecuniary damages for pain and suffering. Family members may also be eligible for benefits under the Family Law Act. Each case is judged on its own merits, based on number of factors including the severity of injury and circumstances of the accident. Whether it is a landlord, business owner or homeowner, neglecting the law is a certain path to being held culpable for someone’s personal injury. If you or a loved one suffered injuries as a result of an unsafe property or circumstance, call the Injury Lawyers of Ontario (ILO) personal injury team to represent you in a claim for compensation. Our staff are compassionate and knowledgeable and well understand the stress and challenges experienced by families, in the aftermath of a serious accident. Your initial consultation is free and in most cases, there are no fees unless we are successful in winning your case.